During memorial day weekend, my family and I went to Camp Waubanong. 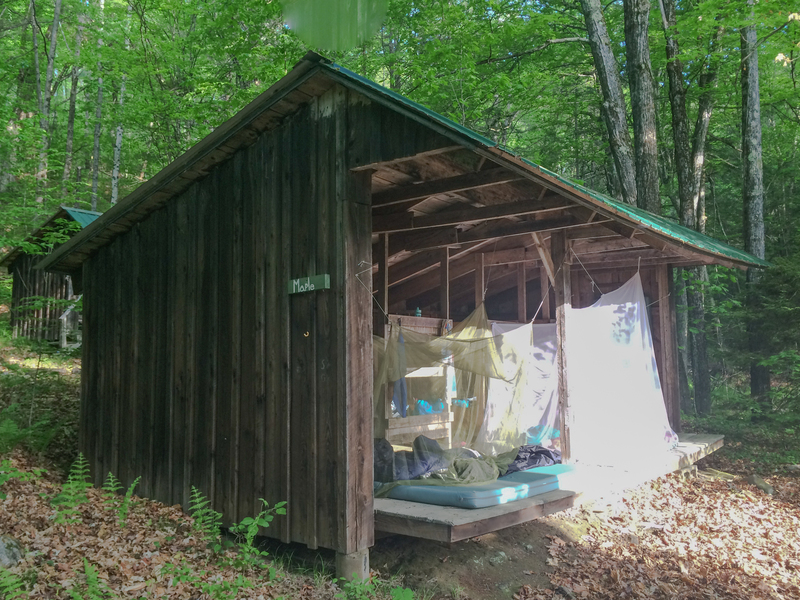 The camp was located in the wilderness of Brattleboro, Vermont. We were there with about 10 other families, all with kids. The camp had adirondack cabins for people to sleep in. Adirondack cabins only have three walls and a roof. 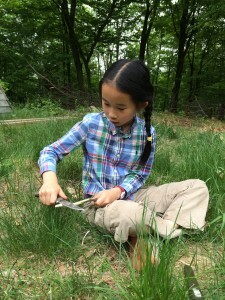 We learned how to survive using primitive resources. At the camp, we did an adventure called Drum Walk. During the Drum Walk, the counselors blindfolded us and sent us about a mile into the forest. There, we made our way back only following the occasional beats of a loud drum in the distance and our other senses. When we were heading into the forest, we walked in a special formation called a snake walk. To snake walk, I stood in a straight line with other people, then I put my hand on the shoulder of the person in front of me. It may seem a bit strange, but it was actually quite comforting to walk through the woods with forest sounds like music in my ears. I almost fell asleep! But once we were separated, I snapped back to the present. As the counselor advised, I crouched low like a spy and stuck my hands out in front of me. Even though I did this, I smashed into trees a few times. The worst part was when I turned right and ran into a field of thorn bushes which scratched me a lot. I tried to turn back the way I came, but instead, I felt more thorns clawing at my legs. So, I decided to move forwards because I figured that I would get out of the thorns at some point if I kept moving. Eventually, I did get out of the thorns. I felt myself getting closer to the sound of the drum. It beat every 5 seconds. Between the drum beats, I would follow the direction where I had last heard the sound. On the beat, I would turn towards the direction of the sound. Soon, I smelt smoke, and could use my sense of smell to direct me. Then I felt a hand grasp my wrist, pull me to a log and command me to sit. I felt my mom’s body next to me, I hugged her. I knew there was a fire in front of me because I could hear the crackling of the twigs, and I could feel the warmth. The drum seemed to go on FOREVER until FINALLY it stopped and the counselors allowed us to take off our blindfolds. First, I was surprised by how dark it was! When we started, the sun was beginning to set, now it was pitch black. After that, I felt really accomplished and that I had achieved something that none of my friends at school had done! We also had a cookout! In the beginning, everyone worked together collecting wood. I had the job of sorting the wood. There were 4 different sizes. A big, medium, small, and pencil. Soon we had a lot of wood and we were ready to start a fire. 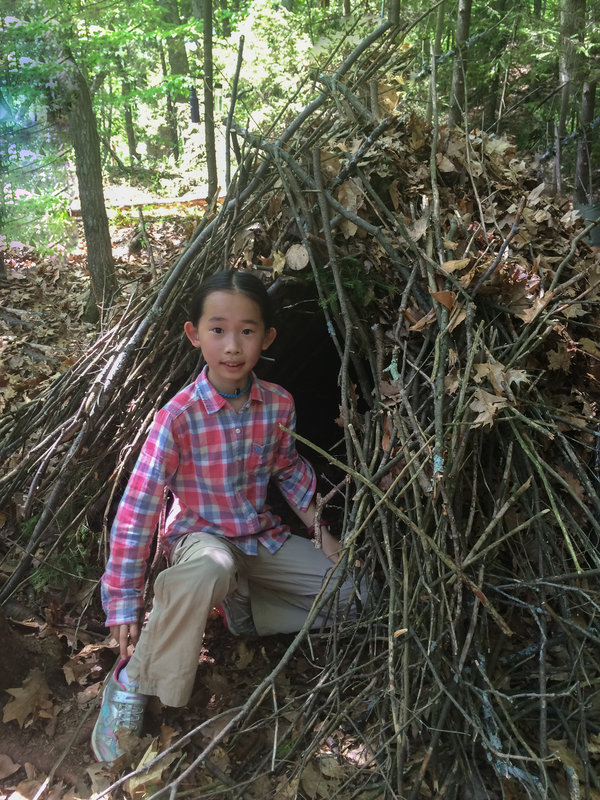 The counselor made a tepee with the pencil size sticks and stuffed it full of kindling. 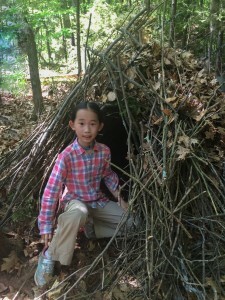 Then, we added on the small sticks as another layer to the tepee. After that, we added medium sticks, and big logs! Finally, it was time to light a fire. One of the counselors put a burning coal into the tepee. 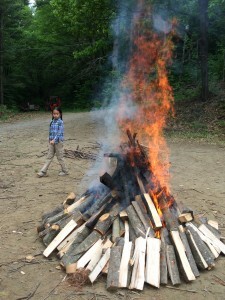 The wooden structure ignited and it burst into flames. The bonfire was so tall that it towered over everyone! Fire seemed to lick the sky. The heat was so intense that if you were three feet away from the fire, your face would feel like it was peeling off. Flames raced down the dry sticks and logs. The top of the tepee was already blackened. Suddenly with a loud crack, the sticks inside gave away and the heavy logs on the outside came crashing down, sending sparks shooting into the air! It was a breathtaking sight! 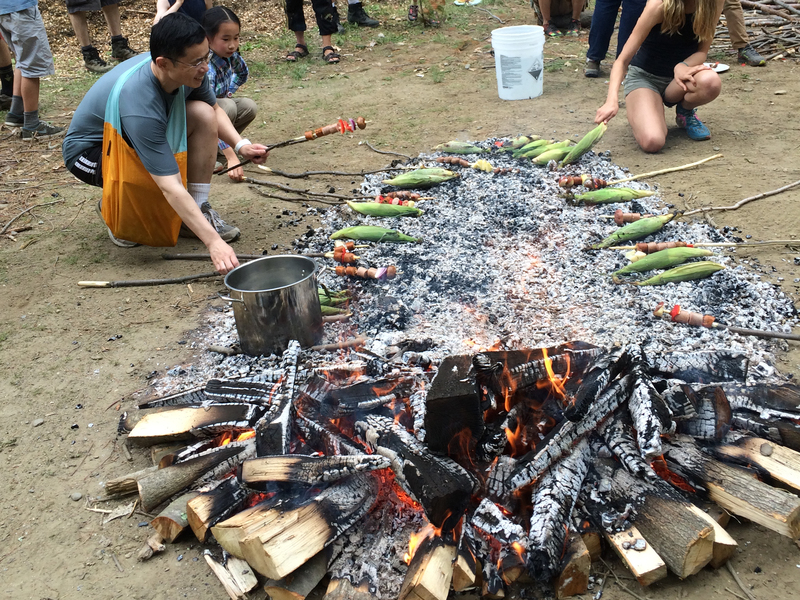 Then, we made skewers out of sticks to cook our food on. The counselors taught us knife safety, and we scraped bark off the sticks. We stabbed food like sausages, onions, potatoes, and sweet peppers on our skewers and laid the skewers on hot coals, occasionally turning the food to make sure that all sides were cooked evenly. 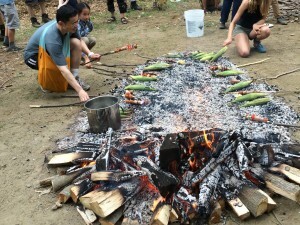 We also laid corn on the hot coals. Finally the food was ready! It was SO delicious!  It was even more scrumptious because we had cooked it ourselves. I truly savored that meal! Near the end of the trip, the counselors asked us what we liked about the trip, what we didn’t like about the trip, and what we were grateful for. The thing I liked about the trip was that I got to feel like a Native American! What I didn’t like about the trip was that there were so many bothersome/pesky bugs! I was grateful for bugspray .